[NOV. 4, 2002] Help wanted: Election Judge. Friendly, civic-minded person to work 15-hour day with no breaks, 1-2 days a year. $75 per day, $25 bonus for attending instruction. Two-year commitment required. See your local precinct committeeman. Do you ever wonder on Election Day who would be willing to work 15 hours straight for just above minimum wage? In the 44 Logan County precincts, 220 dedicated citizens will do just that on Nov. 5. Marian Adams, an Atlanta election judge for 21 years, said she sets her alarm for 4:15 a.m. so she can reach the City Hall boardroom by 5 to prepare for the 6 o’clock opening of the polls. Among set-up jobs are checking all voting devices to see that they have the right candidate lists, marking all voting booths and placing a "Polling Place" sign in a visible spot. Staff of Logan County Clerk Sally Litterly have already set up the booths and ballot box. At the other end of the day it takes Adams and the other four judges at Atlanta 3 about an hour and 15 minutes to process absentee votes, count ballots cast, remove chads and check for write-in votes. "We’re the last precinct to get done," she confessed. Then there’s still the 20-minute drive to the courthouse. "It’s a long day," Adams admitted, "but I like to see the results and who has gotten out to vote." She also sees purpose in the job: "It’s doing our part for the community in which we live." Tom Lowe, East Lincoln 8 judge for 12 years, said there are personal benefits. "I get to meet some people I see only at election time," he noted. "I feel like I’m doing something I like to be into. I’ve always been interested in politics." Litterly underscored the judges’ importance: "It’s necessary to have judges of both parties to guarantee the integrity of the election." Her day is even longer than theirs. She typically reaches the courthouse by 4:30 a.m. and stays until midnight or later. During a major election five judges staff each of the 44 polling places in the county. Two are Democrats, and three are Republicans. West Lincoln 8 judge Brenda Short, who has been on the job for 18 years, said there are four stations. The first person pulls the appropriate application, asks the voter to sign and offers instruction in voting. Next, two judges of different parties check the registration book to verify the voter’s signature and address and mark the voter’s record. The next judge initials the appropriate ballot or ballots, gives them to the voter, and keeps a running total of ballots. The last judge receives the punched ballots and places them in the ballot box. Sometimes the voter is not registered in the precinct. In that case judges try to discover the correct polling place and direct the person there. The last resort on this issue, as on any other that arises, is a call to Litterly’s office. She said she fields questions all day, but some are hypothetical rather than immediate. Adams explained that her precinct’s biggest problem with voters in the wrong place occurred when Atlanta 2 was split. Citizens on the north side of Vine Street were inadvertently assigned to the wrong precinct. Eventually, three or four people had to drive to Lincoln to clear up their registration. One voter still refuses to make the drive, Adams noted. Short said her precinct once received the wrong binder of registration cards. Fortunately, the judges quickly ascertained whose binder they had and exchanged with that precinct. Handing out ballots seems an easy task but can be complicated when different voters get different ballots. This happens in primary elections when voters must get the ballot for the correct party. It also happens when a person has recently moved and is entitled to vote for federal but not local offices. And it occurs when different districts vote at the same place. Then some voters get a particular ballot, such as a tax referendum, while others don’t. Lowe said the recent switch to electing county board members by district created a problem because two different districts vote at East Lincoln 8. He said it took 10 minutes to figure out which ballots to use for each district, identify the corresponding vote recorders and rename the booths. Only an election judge may place the ballot in the ballot box. This judge first checks for the ballot distribution judge’s initials, without removing the ballot from the envelope. Judges rotate positions during the day so all are familiar with every process. Voters often notice the lineup of chips, sandwiches and other goodies. For the most part these are brought by the judges themselves. Short said sometimes a precinct committeeman or even a candidate brings a box of doughnuts. Casey’s General Store supplies pizza slices and chicken strips to all three Atlanta precincts, and one time a Beich employee brought candy, Adams recalled. Judges eat at their stations but try to keep the tables neat. As far as the obvious need for a break, the election judge manual says, "When the polls are open, one judge at a time may leave the polling place for a very brief period, and only when absolutely necessary." Judges must sign in and out for their absences. Occasionally citizens, especially those new to the county, are confused about the voting procedure. "It’s amazing that people don’t want to ask for help," Short commented. As a result, sometimes ballots are spoiled and have to be replaced. Lowe said that at his precinct people sometimes try to punch their ballots using the pencil provided for write-in votes. Judges then have to clean the lead out of the device. Adams said a problem in primary elections is that voters are reluctant to state their party and sometimes do so in a whisper so soft the judge cannot hear. She attributes the lower turnout for primary elections to this same reluctance. Inappropriate attempts to influence other voters are rare but do occasionally occur. At East Lincoln 8, judges have removed a note naming a write-in candidate from a polling booth. Lowe said people sometimes write on the candidate list, so judges must check periodically to see that nothing has been tampered with. In Atlanta an unidentified telephone number was once found written on a voting device at the end of the day. Short said that in one election she had to check booths frequently because people were writing "Vote for Candidate X" on the device. In such a case, judges first try to erase the message completely. If that is not possible, it’s time for a call to Litterly for a new device. Once the polls close at 7 p.m., judges check to see that the number of ballots equals the number of applications. Adams said that in her precinct a careful recount has always resulted in the expected number. Short observed that skipping a number on the applications is the most common reason for an apparent mismatch. Absentee ballots are processed after voting ends, because if people come to the polls, their prior absentee ballots are discarded. Lowe said someone once voted absentee on a sample ballot, which had to be considered spoiled. The manual gives procedures for various discrepancies. If more votes are cast than applications filled out, ballots are withdrawn at random to make the counts match. If a person over-votes, for example writing in a name and also punching one for the same office, two judges of different parties fill out a new ballot marking the voter’s choices for all other offices. If chads or wrinkling make the ballot uncountable, again two judges revote it. Adams, Lowe and Short all said they have never encountered these problems. Depending on the number voting and the judges’ speed, closing procedures may take 30 minutes to an hour and a half. When everything is in order and the necessary forms are signed, a Republican and a Democratic judge drive the ballots and other materials to the courthouse for the official count. Then it’s home for a well-earned rest. "The next day you’re really kind of exhausted," Lowe observed. Short said she wishes the day could be shortened, but consolidating school board and general elections has helped. Sometimes for board elections her precinct drew only about 20 voters, making for a boring and expensive day. It costs $22,000 to pay Logan County judges for one election and somewhat less if a few skip the biennial instruction. For a smaller election with only three judges per precinct, it still costs $13,200. And that doesn’t count other expenses, such as printing the ballots, staff overtime and polling place rental. The state pays the $25 per judge for training, but the county bears the rest of the expense. [NOV. 4, 2002] Carl Oblinger, candidate for the Illinois House of Representatives, announced a proposal on Oct. 30 to reopen the Lincoln Developmental Center in Lincoln. Oblinger will push for legislation to create a three-member commission with representatives of the Illinois Department of Human Services, the employees of the Lincoln Developmental Center and LDC client families. The commission would evaluate which patients in the DHS system would benefit from being transferred to LDC, develop a schedule to reopen the facility and recall employees, and formulate the necessary funding requests for the 2004 state budget. "We still have valuable, skilled staff members and a physical plant at the Lincoln Developmental Center capable of meeting the needs of the developmentally disabled citizens of the state," said Oblinger. "Under a new administration we can find the means to reopen the Lincoln Developmental Center and better meet the needs of Illinois’ most vulnerable citizens." Oblinger again criticized the Ryan administration for the failures at the LDC. "Governor Ryan appointed an unqualified administration at the facility and did not correct problems in a timely manner," said Oblinger. "The governor packed the Health Facilities Planning Board to assure the board’s agreements to close LDC. And the Ryan administration failed to address the overall quality of care for patients throughout Illinois and how the closure of LDC would affect those services," added Oblinger. Oblinger also criticized his opponent, Rich Brauer, for failing to support the community’s efforts to save the center. "I think Rich Brauer’s priorities are wrong and will harm the Lincoln economy as well as the developmentally disabled citizens of Illinois," he said. [OCT. 31, 2002] Justice John Turner, candidate for the 4th District Appellate Court, announced Wednesday that he has received the support of 21 of the state’s attorneys from the 30 counties comprising the 4th Judicial District. Justice Turner indicated that his support from the state’s attorneys is in recognition of the breadth of his experience in criminal law, public safety and law enforcement. Turner has been serving on the appellate court since June 1, 2001, following his unanimous appointment by the Illinois Supreme Court. "In this time when homeland security is the main focus across America, I am pleased to have the support of chief law enforcement officers in the 30-county area I serve," said Turner. The state’s attorneys serve the following counties: Adams, Brown, Champaign, Clark, Cumberland, DeWitt, Douglas, Edgar, Ford, Livingston, Logan, McLean, Macon, Mason, Menard, Morgan, Moultrie, Sangamon, Schuyler, Vermilion and Woodford. Turner said he is proud to add the state’s attorneys to those already supporting his candidacy, including former Chief Justice Ben Miller, former Gov. Jim Edgar, the Illinois Civil Justice League, National Federation of Independent Businesses, the Illinois Education Association and the Illinois Committee For Honest Government. He has also been endorsed by the State Journal-Register and the Chicago Tribune. [OCT. 11, 2002] Justice John Turner, candidate for the 4th District Appellate Court, announced he has received the endorsement of the Illinois Committee For Honest Government. Turner has been serving on the appellate court since June 1, 2001, following his appointment by the Illinois Supreme Court. The Illinois Committee for Honest Government was formed in 1986 to work for a variety of reforms and to promote increased responsiveness in all levels and branches of government. After evaluating Turner's credentials the committee found Justice Turner clearly worthy of the organization’s support, stating, "Turner will be an outstanding member of the appellate court." Judge Turner is a former lawmaker, having served in the Illinois General Assembly from 1994-2001. He was a member of the House Judiciary Criminal Law Committee, Prosecutorial Misconduct Committee and Spokesman of the House Judiciary Civil Law Committee. Prior to his seven-year stint as a lawmaker, Turner was twice elected as Logan County state’s attorney. Turner is also the former Logan County public defender, and he was engaged in a private law practice, most recently with the firm Kelly & Turner, P.C. "My many years of practice in the courtroom, as well as my experience as a lawmaker, are serving me well on the bench. I immensely enjoy my duties on the appellate court, and I thank the justices of the Illinois Supreme Court for the faith and trust they reposed in me by appointing me as an appellate court justice," said Turner. Turner lives in rural Atlanta with his wife, Kim, and their 9-year-old son, Jack. Justice Turner has been campaigning in all 30 counties comprising the 4th Judicial District. "I am taking my message to the good people who live in the 4th District. I am working hard for them on the bench, and I am working well with the other justices on the court. I have participated in handing down hundreds of decisions, and I am asking the citizens of the 4th District to allow my continued service," Turner said. "This practice of a state’s attorney soliciting and accepting a loan from a sitting judge in his home county raises serious ethical questions and undermines the public’s faith in a fair and impartial judicial process," Melissa Merz said. "Paying back the loan after the election is like returning groceries after you’ve eaten them. It does nothing to correct the potential conflict of interest between Birkett and Judge Elsner." Birkett has been under fire in recent weeks for accepting contributions and loans from defense attorneys involved in plea bargaining to get lighter sentences for their clients. In addition, he has solicited and received loans from well-connected DuPage County criminal defense attorneys. Birkett received loans of $100,000 from DuPage County lawyer Tim Martin and $10,000 from attorney Terry Ekl. Martin and Ekl, Birkett’s former campaign manager, both represent clients being prosecuted by Birkett. Martin’s firm played up its insider connection with Birkett’s office in a promotional brochure that boasts of the firm’s "knowledge and ability to conduct very favorable plea negotiations." Another part of the brochure says the firm can often "win your case by filing a motion to quash arrest and suppress evidence." In another case, a lawyer who contributed $3,100 to Birkett’s campaign secured a plea bargain that resulted in a sentence of probation, and 34 days of jail time already served, for a man who attempted to murder his wife by pushing her into a fire. Since August 1995, Birkett has received approximately $244,430 in direct contributions from criminal defense attorneys located in DuPage County. He has received approximately $141,000 in loans from the same group during the same time period. Be sure to insert your ballot card completely into the machine, number side up. Use the metal stylus to punch candidate(s) of your choice. Read instructions on the ballot pages for each office. After voting, remove ballot card and verify for accuracy. Be sure all paper chads are removed and the ballot card has not been bent or torn. If you have made an error, return the ballot card to an election judge. If the vote recorder is not working properly, notify an election judge immediately. [NOV. 4, 2002] There are many different ballot styles for Logan County. We at LDN have provided a compilation sample ballot of all styles. On sections where no styles are indicated, all styles vote. See below to determine which style is yours. If there are more than one style listed for your precinct, you will be given a style when you get to your polling place tomorrow. Please note, you will vote for the same districts as those you voted on in the primaries. If you have any questions or concerns, you can call the Logan County clerk’s office at 732-4148. Click here for the sample ballot. 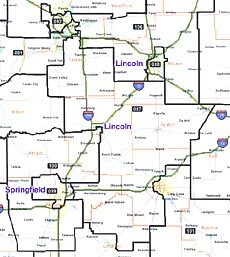 [OCT. 4, 2002] Logan County has been divided into the 87th and 100th representative districts through the state’s redistricting process. The division has also created new legislative districts for senators. The 87th and 88th representative districts will now form the 44th Legislative District, and the 99th and 100th representative districts create the 50th Legislative District. Most of the northern and southeastern portions of Logan County are in the 87th Representative District and 44th Legislative District. 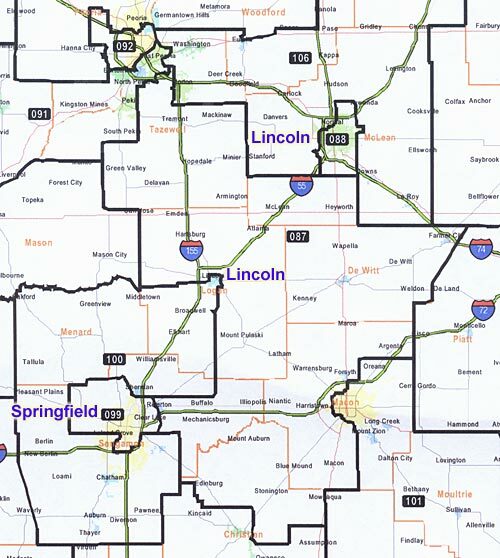 The southwest portion of the county and the majority of Lincoln are situated in the 100th Representative District and 50th Legislative District. 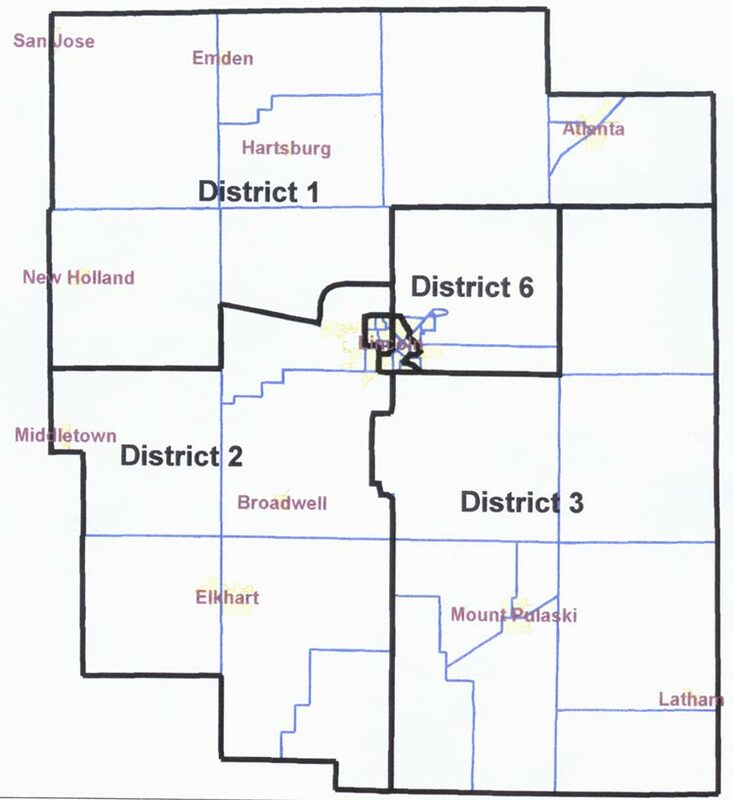 Logan County will also have new county board districts. District 1: Atlanta 1, Atlanta 2, Atlanta 3, Eminence, Orvil 1, Orvil 2, Prairie Creek, Sheridan and part of West Lincoln 7 (north of Route 10 West and Interstate 55). 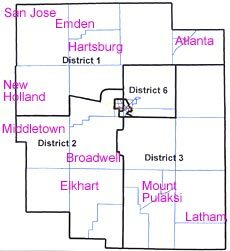 District 3: Mount Pulaski 1, Mount Pulaski 2, Mount Pulaski 3, Mount Pulaski 4, Aetna, Chester, Lake Fork, Oran and Laenna. District 4: East Lincoln 1, East Lincoln 2, East Lincoln 3, East Lincoln 6, East Lincoln 8 (part) and West Lincoln 1. District 5: West Lincoln 2, West Lincoln 3, West Lincoln 4, West Lincoln 5, West Lincoln 8, West Lincoln 9 and West Lincoln 10. District 6: East Lincoln 4, East Lincoln 5, East Lincoln 8 (part), East Lincoln 9, East Lincoln 10, East Lincoln 11 and East Lincoln 12. Districts are printed on the registration cards that voters received earlier in the year. If you are confused about your voting districts, please feel free to contact the county clerk’s office in the courthouse in Lincoln. If you need to change your address, have incorrect information on your voter registration card, or have married and changed your name, it is necessary for you to contact our office by Oct. 8 in order to be eligible to cast a full ballot in the Nov. 5 general election. As always, we encourage your participation in the election process. It is through the process of democracy that our great nation will continue to enjoy the unalienable rights of life, liberty and the pursuit of happiness. [SEPT. 27, 2002] SPRINGFIELD –– Illinois Secretary of State Jesse White is reminding citizens that Oct. 8 is the deadline for applying to register to vote in the Nov. 5 general election through the motor voter program. The secretary of state’s office gives citizens the opportunity to fill out an application to register to vote when applying for or renewing a driver’s license or state identification card. However, the secretary of state’s office only sends the application to the voter’s election authority, which is responsible for registering voters. "Voting is one of our most precious rights that we cannot and should not ignore," White said, "especially at a time when America is uniting to exercise the very freedoms upon which this country was founded." White said that all secretary of state facilities take applications for registration through the motor voter program from those who come to the facility to obtain or renew their drivers’ licenses or identification cards. But after Oct. 8, people who file applications through the motor voter program will not be registered for the general election on Nov. 5. In 2000, White formed a committee headed by Dr. Paul Green of Roosevelt University’s School of Policy Studies that reviewed the motor voter program and recommended a number of changes. The secretary of state’s office has implemented those changes to streamline the motor voter program and make it more efficient. For more information on voter registration, call the Illinois State Board of Elections at (217) 782-4141. 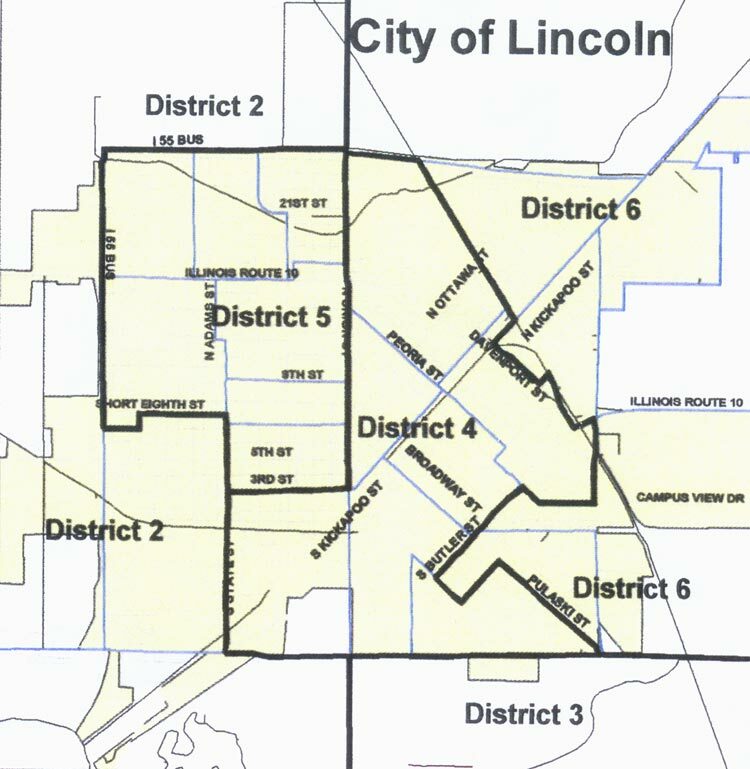 Petitions for nomination of candidates for alderman for the city of Lincoln consolidated primary election to be held Tuesday, Feb. 25, 2003, are available in the city clerk’s office at City Hall from 9 a.m. to 5 p.m. Monday through Friday (except holidays). [OCT. 22, 2002] The Lincoln City Council, in an effort to promote the sales tax referendum that will be on the ballot Nov. 5, has issued a fact sheet explaining the tax. Aldermen will be passing out the sheet to city voters. Compiled by city treasurer Les Plotner, the fact sheet explains what the tax will cost and why it is needed. Because of historically low interest rates and also lower sales tax revenue, the city has no money to upgrade its infrastructure, Plotner said. There is no money for street repair in the current city budget, he pointed out, not because the council doesn’t see the need but because funds are not available. The projected annual income of $550,000 from the tax increase will be used only for improvements to city streets and alleys, drains and sewer line extensions, and other infrastructure. • The voters of Lincoln will have the opportunity to vote on the sales tax increase referendum at the general election on TUESDAY, NOV. 5. Your city council in Lincoln is asking you to approve an increase of one-half of 1 percent on the Retailers’ Occupation Tax, which is commonly known as the SALES TAX. Consumer pays $10 for a pair of gloves. Increased tax cost, 5 cents. Consumer pays $50 for two gallons of paint. Increased tax cost, 25 cents. Consumer pays $100 for a new lamp. Increased tax cost, 50 cents. • The new sales tax WOULD NOT be imposed on certain items. It would not be added to food products people purchase for home consumption. Other items that are exempt from the increased sales tax include prescription and nonprescription medicines, drugs, medical appliances, insulin, urine testing materials, syringes and needles used for diabetics. In addition, the tax WOULD NOT be charged on the sale of motor vehicles. • The burden of a sales tax would be spread out over anyone who purchases items in Lincoln, including out-of-town shoppers. Lincoln has one of the lowest sales tax rates among the larger cities in the central Illinois area. 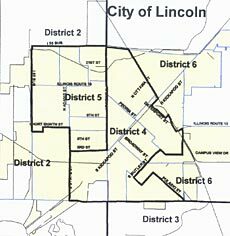 • Lincoln has a desperate need to expand and improve our public infrastructure. We simply don’t have the funds to complete projects or to maintain our current infrastructure, nor do we have the funding for future growth expansion. • What does this word "INFRASTRUCTURE" mean? Public infrastructure includes streets and roads, bridges, access roads, sidewalks, sewer line extensions, storm water drainage, and sewer treatment facilities. • Based upon current projections the city of Lincoln should be able to realize about $550,000 each year in increased revenues as a result of the sales tax increase. The increased revenues must by law be used to update the city’s infrastructure system. I am writing in regard to Rod Blagojevich’s television ads using "ordinary citizens" who accuse Attorney General Jim Ryan of failing to investigate the "licenses-for-bribes" scandal in the secretary of state’s office. His accusation is knowingly false and purposely misleading. Attorney General Ryan has been asked about this subject repeatedly over the course of his campaign for governor. He has stated that the investigation into the corruption in George Ryan’s office was a federal investigation from the beginning. To launch a parallel investigation by the attorney general would have been irresponsible. But don’t take his word for it. Jim Bums (a former Democratic candidate for governor) was the U.S. attorney when this investigation started. He believes that Jim Ryan acted properly in staying out of the federal investigators’ way and not interfering. Former U.S. Attorneys Dan Webb, Anton Valukas, Bill Roberts and Sam Skinner have described Blagojevich’s assertions as "ridiculous." Former New York Mayor and U.S. Attorney Rudy Giuliani has said that if Jim Ryan had launched his own investigation he would be defending himself against accusations of interfering with a federal investigation. Not one law enforcement official in the state has been willing to stand up in support of Blagojevich’s claim that Jim Ryan neglected his duties. In fact, every law enforcement official, without exception, called upon to comment on this matter has indicated that Jim Ryan’s conduct was proper. Nonetheless, Blagojevich continues to spend millions smearing Jim Ryan with these baseless allegations to deceive voters. Blagojevich must think that voters will mindlessly accept anything they are told. I believe he is wrong and that the good people of our state are a great deal smarter than he gives us credit for. Jim Ryan is a person of honor and integrity who would not compromise that integrity for votes. That is why I will be casting my vote for Jim Ryan. What classes would you like to see? It’s time for Sen. Larry Bomke to tell "the rest of the story." Sen. Bomke has repeatedly stated in brochures and radio campaign ads that he has given back $275,000 of his district office money to the state. He also has never refuted the Chicago Sun-Times article (Feb. 25, 2001) that he is one of the "most frugal legislators" and spends only $20,000 a year for office expenses. How does Sen. Bomke pay for his full-time legislative aide, his legislative secretary, his regular office expenses, his districtwide "Legislative Updates," his "Business Updates" and targeted mailings to special groups? Certainly he could not even pay his full-time legislative aide who has been with him for six years for $20,000 a year. This concerns me because it means that someone else is paying for his expenses. I have heard that he uses unaccounted side funds controlled by Sen. President Pate Phillip to pay his office costs. This allows him to "give back" most of his $67,000 yearly budget. While he praises himself for being a "good guardian of taxpayer money," he doesn’t account for how much money he spends or the source. How much does this senator’s office cost the taxpayers each year? Citizens have no way to find out, because we don’t know which funds he is using and how much he spends from each. He can’t say he is for honesty and integrity in government if he isn’t honest about how much money he spends for his district office. Sen. Bomke, will you let us know how much taxpayer money is spent to run your office and from which accounts the expenses are paid? Steve Nichols is our Republican candidate for Logan County Sheriff. As a law enforcement professional, Steve has been serving the people of the state of Illinois for 18 years. He spent nine years as an Illinois state trooper and has been a criminal investigator with the Illinois Department of Children and Family Services for the past 11 years. Steve graduated from Western Illinois University with a bachelor’s degree in law enforcement administration. He is an experienced leader and now trains others on forensic and criminal investigation techniques and procedures. Successful law enforcement today requires expertise and creative management from our law enforcement officials, not just maintenance of the status quo. Steve will restore respect and professionalism to the office of sheriff, hire qualified professionals, provide valuable training, and maintain performance standards for sheriff’s deputies. We urge the people of Logan County to go out to your voting polls on Nov. 5 and vote for an experienced leader, Steve Nichols for Logan County sheriff. Let’s let him put his skills, experience and common-sense approach to work for us. We sincerely believe with cooperation and teamwork he and his staff can and will make a difference for us and for the youth in Logan County. I have been a Republican for the past 20 years, but I would like my fellow Republicans to know why they should not vote for Joe Birkett. As state’s attorney for DuPage County, Birkett’s office chose to prosecute a disabled child for being late to school, though they knew the child’s disability is what caused him to be late, and the school record showed his tardiness was excused. Birkett’s theory was that being five minutes late was the same as being truant for the entire day, even though the law says the opposite. For 11 months Birkett’s men prosecuted this disabled boy, his pregnant mother and his physician father. Then they simply decided not to prosecute any further. There was no statement of innocence, no apology — just a prosecutor and a judge smirking at the family that they tore apart. I would like your readers to know that Joe Birkett is not the kind of man we want in office. We all want law and order, but this is not the sort of man who will give it to us. Too much American blood has been spilled in the cause of freedom to allow this type of man to take it away. No honest man or woman is safe when Joe Birkett is in office. This letter is in response to the letter from Aldermen Verl Prather and Steve Fuhrer in support of raising our taxes again. These two aldermen failed to remind the citizens of Lincoln that the city council, along with the support of Mayor Beth Davis, increased our sewerage bill to $56 earlier this year. It is my understanding that we will be receiving our second sewerage bill increase in January, as they promised us earlier this year. The city council also increased our water bills, by over 18 percent, earlier this year. If these tax increases aren’t enough to disturb you, the mayor and city council allowed the cable company, licensed by the city, to increase their rates without uttering even a whisper of a complaint. Now in this same 12-month period we have Aldermen Verl Prather, Steve Fuhrer and Mayor Beth Davis leading the drive to raise the city sales tax and ask the voters of Lincoln to vote for this, a fourth, tax increase this year. As I stated in my earlier letter, be wary of anyone who advocates raising your taxes, especially four times in the same year. We once again are asking all voters from both parties to vote no in November on the sales tax increase. What would you think of politicians and power brokers who are determined to totally destroy cemeteries owned by churches? Rod Blagojevich and Richard Durbin, along with the Chicago Machine, want to do just that as part of their misguided plan to expand O’Hare Airport. Downstate media hardly ever reports about the proposed airport expansion, and when the subject does come up, it’s only to mention the destruction of homes and businesses. The destruction of the cemeteries is overlooked completely, but it should be a major issue because of its implications. If Rod Blagojevich and Richard Durbin have such complete disregard for sacred ground, what does that say about their attitudes toward the people of Illinois? These are not abandoned cemeteries that are threatened, and the larger of the two, which is owned by St. John’s United Church of Christ in Bensenville, has about 2,000 burials. The smaller cemetery is owned by the Methodist Church and has a mass grave that contains the remains of an unknown number of people who were moved there in 1952 during the first expansion of O’Hare. When you vote, please consider the fact that both Blagojevich and Durbin are in favor of this — destruction of homes, businesses and the final resting place of several thousand people. Men like that obviously have no morals or ethics and can’t be trusted to run this state or represent us in Washington. I support Sen. Lisa Madigan for attorney general. She is smart and conscientious. She is sincere in her desire to be an advocate for all the people of Illinois and has backed up the rhetoric with comprehensive plans on the issues that matter to all of us — lowering prescription drug costs, protecting our communities from sexual predators, targeting meth labs across the state, and safeguarding senior citizens against fraud and abuse. I know Lisa Madigan will fight to protect our families. There are already 102 state’s attorneys in Illinois. Having worked in the attorney general’s office for 16 years, I know that it is much more than just the 103rd "state’s attorney." Criminal cases are only 20 percent of the work. The Office of Attorney General deserves a person with vision for the future. That person is Lisa Madigan. A very important day in Illinois is coming up. Nov. 5 may well be the most important election in 25 years in this state. This election is about character and who has the experience to turn this state around. Jim Ryan has been a prosecutor who has brought dozens of public officials and literally thousands of criminals to justice for violating the public trust and committing criminal acts. He has protected women and children in this state, stood up for consumers, protected the environment, and honored the public trust we placed in him. Ethics and personal responsibility has been a consistent theme not only in Jim Ryan’s career but also in his life. Jim Ryan’s opponent, Rod Blagojevich, tells us how hard he is going to work for us, yet as a congressman he has missed more than 50 percent of his votes in Congress while he has been campaigning for the office he is now seeking. He has missed 31 of 52 (60 percent) of voting days from March 20 to July 24, 2002, according to official U.S. House of Representatives records. Would you get a promotion if you showed up for work half of the time? We have a moral and ethical man in the White House that we can be proud of. I intend to vote for Jim Ryan, a moral and ethical man to lead the state of Illinois, to provide stability and integrity for our future. I hope Illinois voters will join with me in doing so; our state’s future depends on it. Affordable health care, protection from domestic violence, strong towns and villages, expansion of research and development into expanded uses for coal, and safe schools should not be left to the hands of the Chicago machine! Maps don’t lie, and all six of the statewide candidates for constitutional office on the Democrat ticket live within a seven-mile radius of each other in Chicago! Jim Ryan leads a balanced ticket — balanced in terms of geography, skill, dedication and talent. As a voter and taxpayer I want good representation by honest, thoughtful, intelligent and dedicated public servants — not puppets of the Chicago machine. • He launched the most aggressive statewide effort in the nation against violence in our schools. I know because I saw the results of those efforts in my grandchildren’s schools. • He made sure that hospital emergency room personnel were better prepared to respond to victims of domestic violence. I know because I helped implement changes in our hospital. • He has worked for the small communities in Illinois, not just Chicago. I know because I live and work in small communities, and I have seen his support. • He supports the funding of research and development for new uses of coal. New uses for coal could benefit not only the community in which I live, but by bringing new jobs and a stronger economy to the state, all communities would benefit. For me, Jim Ryan and the Republican ticket is the clear choice for a strong Illinois — for small villages, farms and urban areas — for ALL Illinois. In the race for Illinois governor there is a clear distinction in the two candidates. Jim Ryan has demonstrated his commitment to serving the public through his lifetime of service to the people of this state. He has protected our children and our families by creating the most aggressive statewide effort in the nation to address the problem of deadly violence in our schools that led to the nationally recognized "Safe to Learn" plan. He created Illinois’ first Child Advocacy Center, which treats young victims of child sexual abuse in a child-friendly manner. As DuPage County state’s attorney, Jim Ryan started the first such center in 1987, which has culminated in 28 centers throughout Illinois. Jim Ryan supports a ban on partial-birth abortion. Rod Blagojevich voted against legislation to ban partial-birth abortions on two occasions when the issue came up in Congress. Jim Ryan supports a federal law making it a crime to transport a minor across state lines for the purpose of obtaining an abortion. Blagojevich voted against that proposed law in Congress. As voters we have a responsibility to make intelligent informed choices. I encourage all voters to look in depth at the two candidates and their distinctive differences. Jim Ryan has a record he can be proud of — one that has protected Illinois families and children. He has made promises, and he has kept his promises. Check the record of the two candidates; don’t be fooled by the rhetoric. As the mother of three daughters, I am proud to support Jim Ryan for the future of Illinois and for the future of our children. This November we will have an opportunity to elect a Supreme Court justice. This chance comes around only once in a generation, if even that often. The last time we elected a Supreme Court justice was in 1984 when Justice Ben Miller was elected. Prior to that it was 1964 when we elected Justice Underwood. Supreme Court Justice Rita Garman is running in this election to retain her seat on the Supreme Court of Illinois. She has been a judge for nearly 29 years, serving at the Associate, Circuit, Appellate and Supreme Court levels. As the only candidate to have served at every level of the Illinois judicial system, she brings a wealth of experience and unmatchable qualifications to the court. Justice Garman’s vast judicial experience and exemplary qualifications demonstrate why she is uniquely qualified to serve us on the Supreme Court. Just as important, however, is her strong personal character. Having the privilege of knowing Justice Garman, we know unequivocally that she serves the people every day with fairness and an unwavering commitment to integrity. As circuit court clerks, we are keenly aware of the qualities that are required of a judge. Justice Garman exemplifies those qualities. It is for these reasons that Justice Garman has been endorsed by former Govs. Edgar and Thompson, several newspapers, other judges, congressmen, and state and local elected officials too numerous to name. It is also for these reasons that Justice Garman received the Illinois State Bar Association Judicial Evaluation Committee’s highest rating in 2002. We encourage you to cast your vote for a seasoned professional, Rita Garman for Supreme Court. Integrity, genuinely concerned, compassionate are just a few words that come to mind when I think of what we need in our governor. Attorney General Jim Ryan is that type of person and will be that type of governor. He is concerned with the direction in which our state is going and wants to make a difference by expanding our state’s economy without raising taxes. The leadership of our state needs to focus on what everyone needs, including jobs, education for our children, affordable health care and restoration of the public’s faith in our government. I recommend that everyone should participate in the voting process by showing his or her support for a governor that will be there for everyone, not just a few. Please show your support for Jim Ryan by voting on Nov. 5. Voting is the only way we can make a difference. I paid the price to bear arms by serving my country. Why should I have to pay again? Rod Blagojevich has already stated he wants to raise gun owners’ ID cards from $5 to $500. Maybe the people up north can afford that, but Jim Ryan knows about the burdens it could cause on downstate hunters. Jim Ryan represents all Illinoisans. He wants to restore our fiscal sanity to the whole state of Illinois, including the capital. We pay Rod Blagojevich’s salary but he doesn’t show up for work every day, only when it’s convenient for him. This is his way of evading important voting issues. He picks and chooses the issues he wants to deal with and avoids the issues important to me. Jim Ryan wants to ban partial birth abortions. That one statement alone should be enough to win your vote for Jim Ryan. The experts are predicting a Democratic sweep of state offices in November. That includes Rob Blagojevich, son-in-law of Chicago Alderman Richard Mell, as governor, bringing Chicago-style politics to Springfield. In the last 20 years, about 20 Chicago aldermen have gone to prison. In the last 20 years, about 20 Cook County judges have gone to prison. Remember the last two Democratic governors? Dan Walker and Otto Kerner both went to jail. The sweep would include Lisa Madigan, daughter of Chicagoan House Leader Mike Madigan, as attorney general. The sweep would also include Dan Hynes, son of former Cook County Assessor Tom Hynes, as state comptroller. They all live within a few miles of each other in Chicago and owe their allegiance to the Chicago machine. If higher taxes, bans on smoking, gun control, lousy schools, slavery reparations and corruption appeal to the voters of Lincoln, they should flock to the polls and vote Democratic — making sure to vote early and often. Then move over and let the Chicago thugs intrude on their town and their lifestyle. I am writing to share my experiences with Attorney General Jim Ryan’s office with your readers. 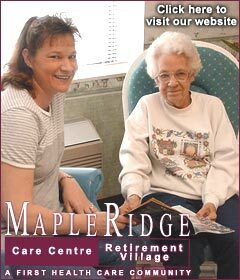 I am a senior citizen living alone on a fixed income. I am contacted regularly by telemarketing firms and salespeople. I have had two occasions recently in which I have needed to contact the attorney general’s office. I contacted Jim Ryan’s office because I did not know where else to turn to get assistance. In both instances I was treated with courtesy and respect. Both times I could have easily been a victim of consumer fraud and, because of the efforts of Jim Ryan and his staff, my problem was addressed and those responsible were dealt with. The attorney general went beyond the mere solution of the problem and even followed up later with me to ensure that I was not experiencing any further difficulties. I see this as an example of public service the way it is meant to be. If we can expect the same type of response to citizen needs for assistance and support when Jim Ryan is governor as I have experienced with him occupying the office of attorney general, this state and its people will be well served. Jim Ryan is not a political insider. He has shown me and countless others that he is not afraid to stand up for what is right for each citizen who needs assistance. He filed suit to block the discounted deal for the settlement of debt for a Springfield hotel, and he has filed suit against major tobacco manufacturers, in just two examples of his willingness to stand up for his principles even in the face of political adversity. I urge your support for this fine public servant. We need more like Jim Ryan in public office.